7. The quest for a Universal Language. The curse represented by language multiplicity, we should remember, had not only political effects, but also cognitive ones. Prior to the Tower of Babel, as the first verse of Genesis XI(12k) emphasizes, men all spoke the same language. This 'adamic' language spoken in the Garden of Eden (44k) was transparent. Its words provided direct knowledge of the nature of things. With the Babelian curse, man's intimacy with the world, afforded by such a language, was lost. Since Knowledge too is Power (as Chancellor Francis Bacon urged his countrymen to realize), by losing the original language men also lost power. 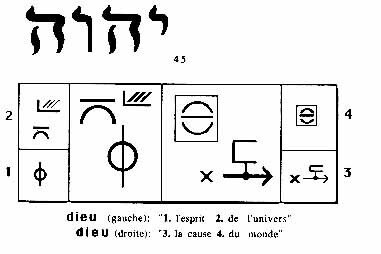 Nobody knows what the original language was , but Hebrew -- or rather, "original Hebrew" had a good claim to be it. 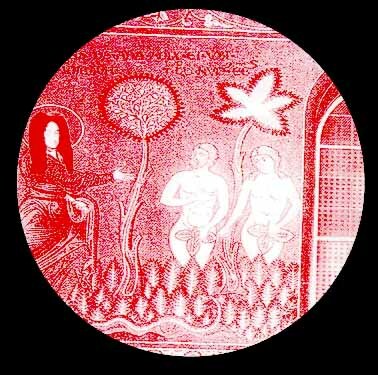 Much of the appeal of the Kabbalah both for Jews and non-Jews -- resided in its supposed ability to disclose in the words of Hebrew that secret, pre-Babelian, knowledge of nature characteristic of the Adamic language. Another way to overcome the curse was to attempt to invent a Universal Language. Ever since the seventeenth century such attempts were quite popular. Scientists considered such an endeavor very important. 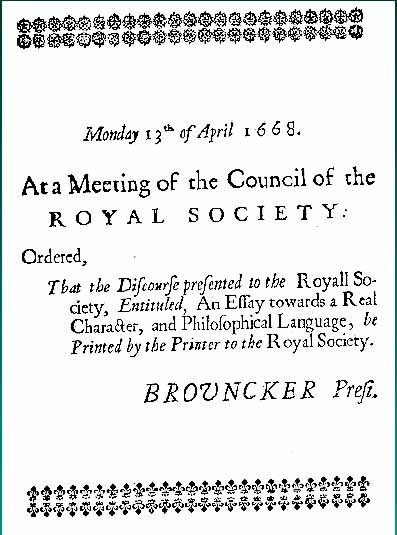 In the second half of the seventeenth century, the prestigious Royal Society of London commissioned one of its members, John Wilkins, to create such a language. 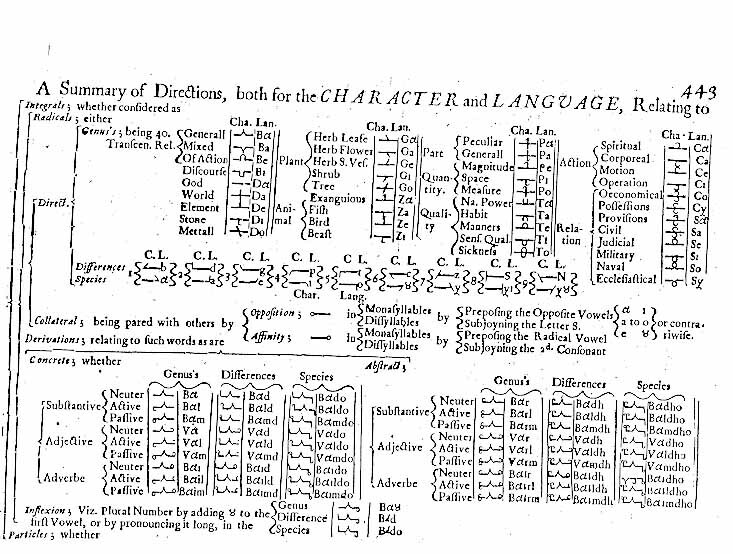 Wilkins spent several years working in this project and came up with a well-designed Real Character and Philosophical Language (71k),published in 1668,With the imprimatur of the Royal Society(49k).Unfortunately, the result was extremely complicated (119k) and far fromthe alleged transparency of the adamic language. As a result, Wilkins' laborious language was barely used in a couple of letters between members of the Royal Society (139k). It would have fallen into total oblivion, were it not for Jonathan Swift's satirical account of Wilkins' and similar Universal Language projects in his Gulliver. Nevertheless, scientists continued to believe that the success of their disciplines depended on well-formed, transparent, and especially "non-natural" languages. Lavoisier's reform of chemical notation, at the end of the 18th century, was based on this ideology, and indeed is widely acknowledged as an important step in the development of chemistry. 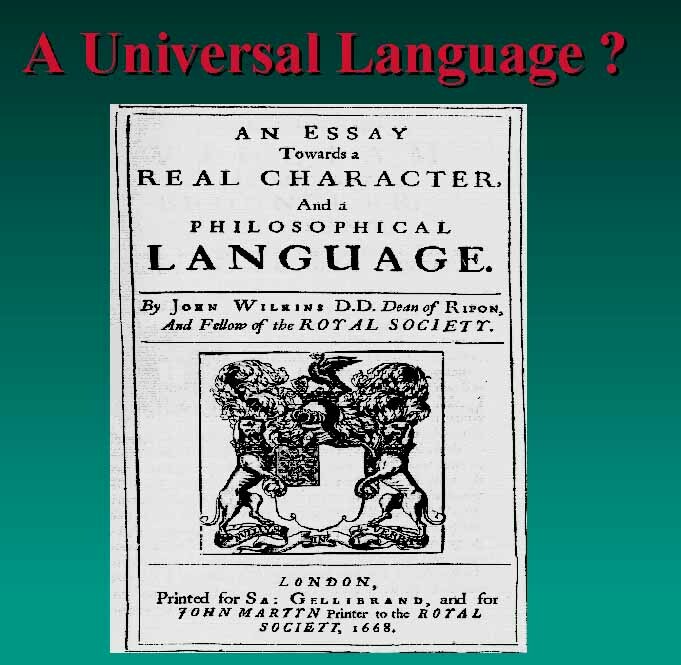 Several dozens of 'universal languages' have been created by scientists and non-scientists ever since. I have written quite a lot on this matter, and my friend Umberto Eco has recently published a book- length study on the topic. The most recent attempt I know of is by a young French scholar, Eric Cattelain, who uses non-verbal signs for this purpose. Some of his work is exemplified in a review article by him, published in the journal I edit, Pragmatics & Cognition. (A bit of publicity never hurts). 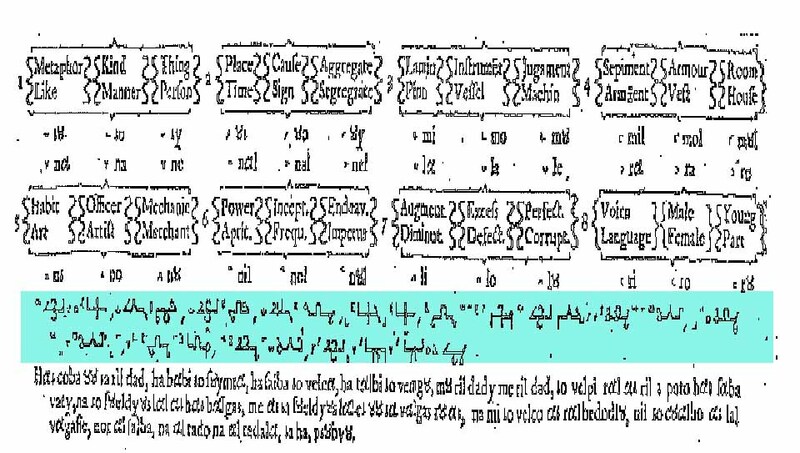 Here is how the concept "God" (15k) is represented in Cattellain's notation.